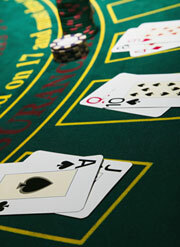 The game of blackjack is played amid the dealer and a player. The players play in opposition to the dealer moreover, the main objective of blackjack is to get closer to 21, without going over it. In the beginning the dealer deals two cards to each player and a dealer has a card face up and another card is hidden. After receiving all the cards there are many options that a player can choose. Hit: It means that a player want another card. Assuming that you will not cross the limit of 21, you can take this option again if you want to. Stand: If you say stand, then it implies that you are contented with your current hand and you will not take an extra card. Bust: If the dealer's or your hand crosses the limit of 21, then it is known as bust. If such situation the dealer loses his hand as well as the bet that you have placed. Double-Down: This option permits you to increase your bet in return of one card. In case, you double down, then you will be given one card by the dealer and then you cannot hit as you have to stand. When the dealer's face up card is weak like a 6, then only this option should be taken. By doubling down in such a situation you have a good probability of wining if the dealer busts. Split: This happens when players have two similar cards. In such cases, a player is permitted to proclaim a split. In this option players have to double their wager and the player's hand is divided in two hands. If you split aces then a dealer cannot hit once they are split. After this, the player plays his hands normally. Surrender: This option permits a player to surrender the hand if he thinks that he will lose and the bet will be returned. Insurance: when the dealer reveals an ace, he gives the players a choice to go for insurance. This is a kind of bet on whether the dealer has got a blackjack and it is equivalent to half of original bet. Stand on 17: the dealer ought to stand if he reaches 17. This implies that he can hit until he reaches 17 or can also bust. Dealer Blackjacks: When an ace is exposed by the dealer he gives the option of insurance to the players. If the dealer display face card and have an ace underneath it, then players lose.